CHARLOTTE, N.C. — For most NFL players, the typical causes of perspiration are the physical requirements of football. 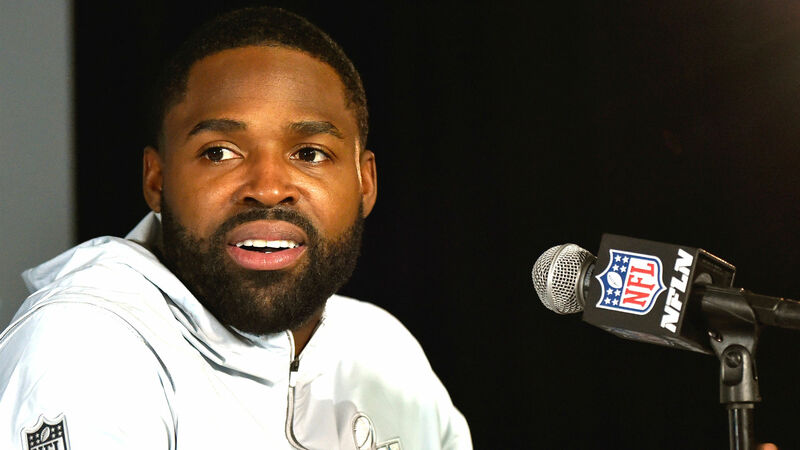 Panthers wide receiver Torrey Smith on Tuesday was sweating because he was standing in the sun and wearing a dark gray suit … while questioning district attorney Spencer Merriweather on the issue of bail reform in front of the Mecklenburg County Courthouse. For most NFL players, passionate, motivational speeches delivered to teammates are not uncommon. Smith on Tuesday was delivering one to a group of incarcerated boys at Mecklenburg County’s Jail North. Most recognize the unique power a professional athlete carries in his or her ability to bring awareness to societal issues and, potentially, bring about change. A combination of deep knowledge and unwavering action only amplifies that power. So what Smith did in Charlotte during his off day this week was powerful, to say the least. Such activism is nothing new for the Players Coalition, which aims to achieve social and racial equality using athletes’ influence and support to impact social and civic change. Smith, 29 and in his eighth NFL season, serves on its governing board. Charlotte, where Smith landed in March when he was traded to the Panthers after stints with the Ravens, 49ers and Eagles, now joins Philadelphia, Boston, New Orleans, Baltimore, Detroit and Atlanta as cities in which the Players Coalition has organized Listen & Learn days. In each city, players like Smith provide input and participate in the planning process regarding what topics and systemic issues should be covered. In Charlotte, Smith facilitated conversations around criminalization of poverty, juvenile justice, segregation in education and bail reform. All Listen & Learn events, which are holistic days at the beginning stages of any footprint/action plan, are organized with the assistance of strategic partners. Smith on Tuesday was joined by members of grass roots organizations Durham for All and Forward Justice, as well as the Justice Collaborative and local historian Pam Grundy. The group — which received vital support from Charlotte-Mecklenburg Schools, Mecklenburg County Sheriff-elect Garry McFadden, the district attorney’s office and the public defender’s office — began its Listen & Learn tour at Jail North. McFadden greeted the group outside Jail North, a facility of which he’ll be in charge come Dec. 3. Before a tour of the jail, Smith asked for and received McFadden’s promise in delivering on his visions of better treatment for incarcerated youth, including a lack of solitary confinement, resources for the jail’s in-house grade school and improved support for young men and women upon release. The tour of the jail, which included stops in a classroom and a large area soon to be remodeled into a barber shop, featured a visit with six young men who were detained in a maximum-security area as a result of their threatening behaviors toward facility staff or fellow inmates. Smith shared with those kids the story of his upbringing in Virginia, including the fact that is mother was a convicted felon, and explained why and how his experiences motivated him to stay out of trouble. He called their time in jail a “speed bump” in their lives and encouraged them not to let the time define them. Smith listened as McFadden delivered them promises of support. He listened as one of the activists in the group spoke emotionally of a flawed criminal justice system. All speakers noted the fact that each of the six young men, dressed in green jumpsuits, was a person of color. Before he left, Smith hugged each one. Smith and the group then headed to the courthouse to meet Merriweather, discuss the function of the DA and receive an overview on key issues like bail reform. That’s where a striking scene took place. Anybody who follows the NFL would be surprised to see a team owner flank one of his club’s players in activism. That’s especially the case for a franchise that, before July, was owned by Jerry Richardson. But as Smith walked off the bus and approached the courthouse entrance, there was new Panthers owner David Tepper, waiting to join Smith in grilling Merriweather on the issue of money bail like two defensive backs double-teaming a star wide receiver. Smith, Tepper and Merriweather spoke at length outside, and the conversation continued even as the three passed through security inside the courthouse. The chat was interrupted only by the group’s opportunity to watch roughly 20 minutes of live bail hearings around relatively minor crimes. The three continued their conversation after witnessing the hearings. Tepper was particularly aggressive in requesting clarification from Merriweather regarding what he had just seen. One question Tepper asked: If any of those defendants had the money to pay bail, would they have been locked up? “No matter where you are, bail, it just never makes sense,” Smith told SN. “If people aren’t a danger to society, they shouldn’t have a price tag on their freedom. And when people actually do get a bond, it doesn’t make sense that if you and I commit the same crime, our bonds are the same, (and) I’m all of the sudden locked up, which is spending more tax dollars, but you can go (home) because you have the extra money to do it. To learn more about policy initiatives surrounding money bail and disparate treatment based on wealth and race in Charlotte, Smith and the group then followed chief public defender Kevin Tully to the nearby public defender’s office. There, they also heard from assistant public defender Liz Frawley on recent legal challenges involving criminalization of homelessness. And, perhaps most powerful of all, Smith and the group listened to the testimonies of citizens for whom the criminal justice system had failed. One of them, a Charlotte native who spent more than 20 years in prison and has since turned to activism, told Smith he couldn’t remember a Panthers player or official making such a meaningful push toward reform in the team’s 24-year history. “What I learned is that it’s important for the public to know that they can hold judges and the DA accountable with their voice and their vote,” Smith said. The last stop of the day was Sedgefield Middle School, where principal Erik Turner had agreed to meet with Smith and the group to discuss a forthcoming integration initiative and other attempts at improving local schools, not to mention the personal experiences of another Charlotte native. While on bus to Sedgefield, Smith received history lesson from Grundy on local school segregation and desegregation attempts. He and Grundy both referenced that history while speaking with Turner. At each stop on his Listen & Learn tour, Smith did exactly that. He listened, and he learned. He also asked informed questions, some of which those in power danced around with their answers. He told McFadden and Merriweather he plans to follow up and hold them accountable for their promises, the former on jail programming and the latter on work being done on bonds. The next step for Smith and other players in the Coalition is addressing a potential action plan while continuing to hold meetings behind the scenes. And previous action plans have been successful. Smith, who played for the Eagles last season, helped former teammates Chris Long and Malcolm Jenkins in an eight-month effort to pass HB 1419, the Clean Slate Act, in Philadelphia. The legislation automatically seals the records of people with misdemeanors who earn no further convictions after 10 years, as well as those who have been arrested but faced no convictions. Tuesday was the start of a new effort. It also was Smith’s day off from his job. NFL players don’t get many of those in October. Smith could have been doing anything on this day, but he chose activism, and he will continue to choose activism. He’ll keep sweating, even if the culprit is a suit, not a helmet and pads.